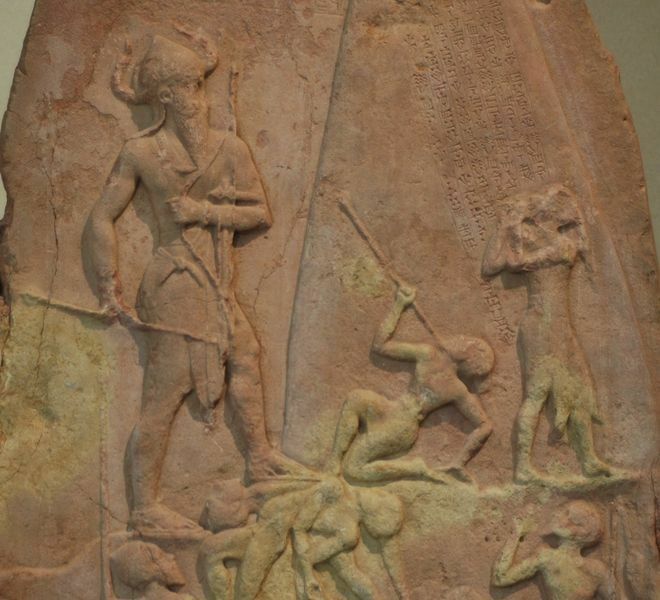 Victory Stele of Naram-Sin, King of Akkad and Grandson of Sargon of Akkad. At the Louvre. Marie-Lan Nguyen/Wikimedia Commons. Naram-Sin (2254-18) was the grandson of Sargon, founder of the Akkad Dynasty [see 1st Empire] that was headquartered in Akkad, a city somewhere in northern Babylonia. While Sargon called himself "King of Kish," military leader Naram-Sin was "King of the four corners" (of the universe) and a "living god." This status was an innovation that is recorded in an inscription that says the deification was at the request of the citizens, possibly because of a series of military victories. A victory stele now at the Louvre shows a larger than normal, divinely horned-helmeted Naram-Sin. Naram-Sin expanded the territory of Akkad, improved administration by standardizing accounting, and increased the religious prominence of Akkad by installing several daughters as high priestesses of the important cults in Babylonian cities. His campaigns seem to have been waged mostly in western Iran and northern Syria, where a monument was built at modern Tell Brak made of bricks stamped with Naram-Sin's name. Naram-Sin's daughter Taram-Agade appears to have been married to a Syrian king for diplomatic reasons. Source: A History of the Near East ca. 3000-323 B.C., by Marc Van De Mieroop. Who Was the Babylonian King Hammurabi?